Today I met a precious little boy who has not yet been named. The nurses have guessed that he is probably about 3-4 months old. Zeke and I walked over to the babies' house to meet him this afternoon. Zeke just kept saying, "He is so cute!" 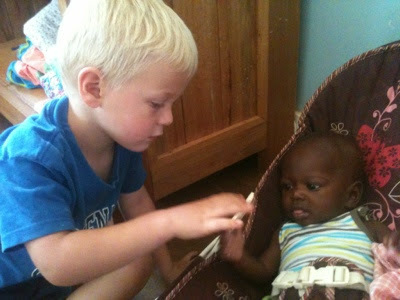 Here is a picture of Zeke meeting this precious little boy. 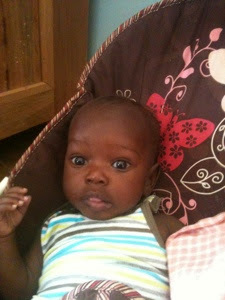 Please pray for this little one as he adjusts to life here at GSF. Please also pray for the house moms to know how to best care for him. Thanks for your prayers!